We've mentioned it here before, the New Jersey Devils are a mess... and we aren't the only ones who have noticed it. Holmgren had one ace to play, and that was Peter Forsberg as a rental. His trade to Nashville that ultimately brought back Scottie Upshall, Kimmo Timonen and Scott Hartnell represented the underpinning of the immediate 2007-08 revival. Brooks notes that New Jersey could follow the Flyers path by trading their remaining blue chip. Lamoriello doesn't quite have that ace. What he has on his team are nine players with no-trade clauses who would have to be massaged in order to be moved -- impending free agents Jamie Langenbrunner and Jason Arnott are worthy -- and what he has is Martin Brodeur. He then suggested that a Marty trade to say perhaps... Washington, might fetch a "John Carlson or Karl Alzner -- or Mike Green? -- plus a young forward along with a critically needed No. 1." Just yesterday, Scott Burnside of ESPN revisited the idea of Sean Avery's friend "fatso" being moved to re-secure the future of the franchise. ... But, what is the team's most valuable asset? Is it not Brodeur? The game's greatest goaltender is back from an elbow/arm injury but has played poorly, a function perhaps of rust and the team in front of him. He has another season left at $5.2 million in salary and cap hit. Hard to imagine he would play beyond the end of his current deal with the team in such dire straits. Would Brodeur waive his no-trade clause for another shot at a Cup? Who knows, but what would Brodeur's value be to a Cup-hungry Washington team that has two promising young goaltenders and a bevy of young prospects? Or to Tampa? What was once unthinkable (Brodeur in a jersey other than the Devils) now must become part of the discussion for a team at the bottom of the well. We ask the question because it begs it on a number of levels. Grant it the list of top contenders that are in need of goaltending help is short, but why would it work out so simply? The short answer is: It wouldn't. Martin Brodeur IS the New Jersey Devils. He is the main reason the franchise has had any success at all. Positively, he was the backbone of their Cup teams. 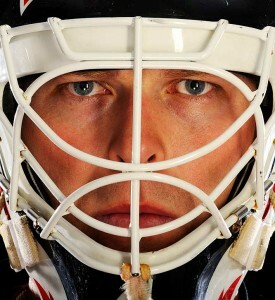 He owns every goaltending record there is to own, and is a certain Hall of Famer. We made the trek to lovely downtown Newark once this season. The Devils were taking on division rival and premier visiting draw, Pittsburgh. The announced crowd was 11,000 at the Devils sparkling "Rock Center" arena. The actual butts in the seats, were closer to 1,100. About 987 of them were wearing Sidney Crosby sweaters. What kind of PR hit would the team take trading away their most enticing product? If watching Brodeur re-write history with every victory can't bring Devils' fans to the rink, what makes anyone think that Mike Green and a 1st-rounder will in his stead? On the flip-side, should a team like Washington or Tampa consider making a deal, what would they be willing to part with in return? Consider that as much as Brodeur means to Jersey, both past and present, to a rental/buyer franchise, he represents a netminder that has fallen early in the post-season recently, even when backstopping good Devils teams. Brodeur has also encountered injury problems the past few years; and has not performed well for most of this arduous first half. If you are George McPhee or Stevie Y, do you swap a number one, along with some top talent for the 2011 version of Marty? Does Brodeur put a Caps team over the top despite their frequent defensive lapses? Remember he couldn't get past the the first round when Jacques Lemaire had the Devils playing 60 minutes of defense. Does he help Tampa go all the way? Not if they have to disrupt the current NHL roster by giving up a key young player to acquire him. Not to mention that there is another goaltender who has significant experience and recent playoff success out there. His name is Evgeni Nabokov... and no trading of draft choices, prospects or NHL talent would be required to obtain him as a free agent. If you must make a trade, Tomas Vokoun is in a similar salary slot and has played lights-out behind a poor Florida team for years. Why roll the dice with Marty on either side? As badly as the Devils need help they won't find it in dealing away the franchise cornerstone. Well written #1 I agree with you.